MONTREAL, Canada, Mar 10 2009 (IPS) - Some of the first species impacted by increasingly acidic oceans have been identified just as scientists meet in Copenhagen this week to present new data showing that climate change is far more urgent and serious than current economic problems. "We think we are the first to document effects in the field as opposed to in a laboratory experiment," said William Howard of the Antarctic Climate and Ecosystems Cooperative Research Centre, Hobart, Tasmania, Australia. Shell-forming creatures – mussels, corals, hard planktons, shrimps and many more – all need those carbonate ions to build their shells. Research on the effects of acidification on marine species in the open ocean is just getting started. Lab experiments had previously shown that the ocean's shell-forming creatures produce thinner shells in more acidic ocean waters, so William Howard is unlikely to surprise the 2,000 attendees in Copenhagen when he presents his findings. And no one knows at this point if the thinner shells are harming or affecting the forams. 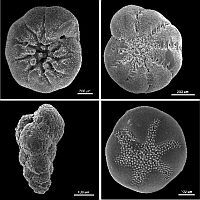 And it turns out that forams have a particularly tough shell, utilising calcite – the most stable form of calcium carbonate and less sensitive to acidification. Many other shell-forming species that are vital parts of the oceanic food chain like pteropods utilise a carbonate mineral called aragonite and are likely to be more vulnerable to acidification, researchers warn. Another new study has found that the larvae of clownfish – the bright orange and white reef fish – were unable to detect the odours from adult fish that led them to their breeding sites. This lab study shows that acidified waters that are expected before the end of the century affected the larvae's ability to follow odours, disrupting the breeding cycle of an important fish species. The world's leading marine scientists are increasingly alarmed by acidification and its impacts. Last Jan. 30, they issued a warning to policy makers called the Monaco Declaration that states "acidification is accelerating and severe damages are imminent" and that corals will not survive in most of the oceans by 2050. The declaration was a dramatic step for scientists, says signatory Victoria Fabry, an oceanographer at the University of California, Santa Barbara. "The potential is there for drastic changes in the oceans," Fabry told IPS. There is a crucial need to alert policy makers and the public and to act soon. "We can make a difference by reducing emissions," she said. "About two percent of the Gross World Product would need to be invested in energy production, efficiency and usage to reach the stabilisation target of 450 ppm, a cost considered to be tolerable by most economists," said Hermann Held of the Potsdam Institute for Climate Impact Research, Germany, who helped craft the Declaration.